This feature article was provided by Medhat Mahmoud and is part of our Improving DAM In 2017 series. 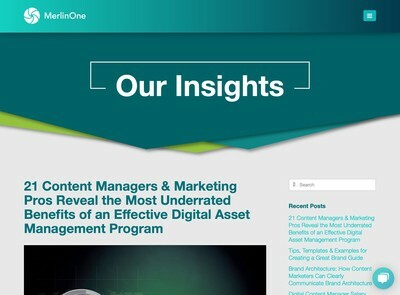 In a previous article “Digital Asset management”, the innovation path from “digits” to value, I discussed the concept that Digital assets can appreciate in value and sophistication. The more connected and shared you make them, the more value they generate with potential of huge commercial implications within the IoT industry and beyond. To elaborate on that, I would say that the concept of IoT “connected society” or “connected world” combined with the “shared” economy phenomena, if enabled by a fully integrated IoT eco-system, are laying the foundation to unlock the real value of digital assets to grow from a tiny vertical industry to a more horizontal and integrated business model that touches everyone’s lives. In essence, everyone, every entity, every organization has some sort of digital assets with a set of value associated with them. Once explored, and shared with other connected eco-system through platform infrastructure, the data value could exponentially appreciate with a simple exchange model of data value contribution in return of a profit in certain “format”. To put this into perspective, let’s look at the success of the shared economy with the example of Uber and AirBnb, where their platform infrastructures enable the car and home owners to share their own assets with the public, in return of profit. Through a working business model, they have created new business opportunities while changing the landscape of other legacy businesses and job market. Here, with this example, the platform and associated technologies enable the creation of such successful model where individuals manage their own assets and gain value out of it. Now, let’s expand a similar model to another two areas, healthcare, where a person owns his/her own “health data” that, if contributed and shared with other entities, by transmitting and sharing them seamlessly, voluntarily and anonymously with other millions to enable the research and advance of certain medical treatment. Whether this person is poor or rich, anywhere in the globe, Africa, US, Asia or anywhere, he/she will contribute with the value of his/her own data to research medical institution or a business entity such as pharmaceutical industry, which will, in return, benefit from the advanced treatment out of this contribution. In this model, there is a transformed value that can be translated into a business model for all parties involved in this chain of digital assets value exchange (not to mention the positive impact on the advances of humanity and cross-cultural collaboration). In the supply chain management area, let’s say a product is tracked all the way from the source to the destination ending with a consumer, a wealth of valuable data can be gathered, analyzed and re-packaged to third party who is willing to pay for the extracted data value, not necessarily from the product data itself but from the social or marketing information of that product during its lifecycle. The extracted value will help, not only to improve the product or achieve better profit, but will accelerate the innovation cycle creating new set of features of the product. The fast pace of today’s evolving technologies, falling hardware costs, wireless ultra speed advancement like 5G, heavy investment in IoT, shrinking power requirements for devices and sensors and advancement in technologies like Artificial intelligence, machine learning, combined with new set of protocols like Blockchain, are all moving very fast and enabling the creation of exponentially increasing amounts of data which can be transformed into value through the medium of digital assets. There will be a generation soon that will witness this “value” chain transformation model where data assets are owned, shared and managed directly in a simple “value” contribution and exchange mechanism. At that stage, it won’t really matter, whether it’s IoT, Blockchain or other technology, the data will simply become everyone’s business. I am fully onboard with this idea that digital assets currently have more value than typically attributed to them, especially in the enterprise context. 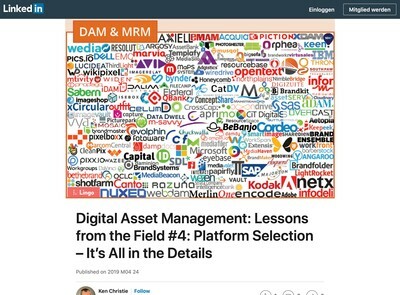 This article brings to my mind questions about what’s next for the process of digital asset management and DAM platforms. In the Uber model above, individuals hold a lot of responsibility for managing their own resources and looking forward with digital assets, individuals would have a lot of responsibility for managing their own digital assets that hold potential to bring in revenue. In that case, would DAM need to accommodate those people who do not operate in enterprise settings? In the medical model, this is also a question. Do individuals need their own DAM to manage these individual medical assets that would be provided to researchers in hopeful exchange of advanced treatments? In the supply chain model, perhaps DAM platforms as they are today could be adjusted to capture the kinds of data that would be purchased by third parties and then used to accelerate product development. But as Ralph said, many current solutions are tailored for marketing so this case would also likely require changes to DAM platform functionality to accommodate these wider ranges of use for digital assets and their “huge commercial implications.” So if we accept that digital assets in and of themselves today have and in the future will increasingly have greater value beyond marketing resources, what does that mean for the development of DAM products, solutions, and platforms? Lots of room for brainstorming here even with just the three examples Medhat provides. 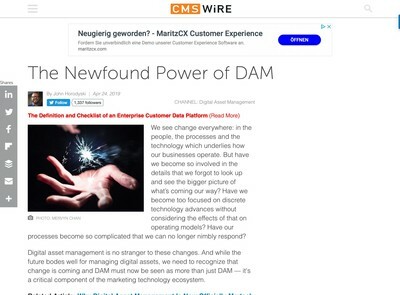 DAM systems are just one piece of the larger information management pie, which includes all types of data, content, and information systems. As information becomes more connected, we will need to develop standards to connect the various types of systems and workflows, instead of trying to bloat current systems with functionality to manage every type of asset, including the kitchen sink. Information systems (DAM, PIM, MDM, PLM, DM, RIM, etc.) are databases, and those records can absolutely manage non-digital assets through the use of “surrogate” records, as already is commonplace in the library/museum/archives industries. 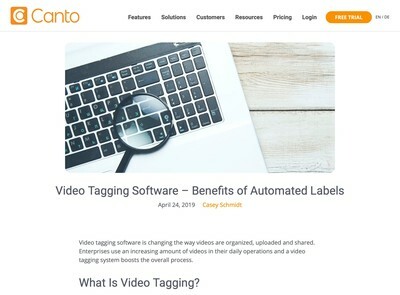 Abstract ideas and certainly people themselves are already being managed as abstract entities within various types of databases. I agree with what Ralph has written about extensively in his “supply chain” series…we need to work on creating standards for repositories, data models, ontologies, and the connection/exchange technologies that can bring this all together. Like plug ‘n play! As day by day blockchain technology is having a significant role on internet on thing as in security purpose.